Last Spring when I was in Washington, D.C. to attend the Global Food Security Symposium, my friend and fellow food blogger, Laura Kumin and husband Kevin invited me to stay with them and enjoy a beautiful walk through the famous Cherry Blossom season and some delicious homemade food, including test recipes from the cookbook Laura was writing at the time, The Hamilton Cookbook: Cooking, Eating & Entertaining in Hamilton’s World. I remember having the most delicious homemade Apple Pie and Vanilla Ice Cream that are both recipes in the cookbook and even more special now knowing that she shared her test recipes during my visit. I first met Laura, a Food Blogger and Founder of the website, Mother Would Know: Home Cooking Beats Takeout when we both attended the Eat Write Retreat in Washington, D.C. several years ago. We hit it off pretty much instantly. I remember feeling particularly shy and introverted at this workshop for some reason and Laura was super nice and interested in what those of us at the table were writing about and where we all came from, rather than talking about herself- even though her own story as a retired lawyer turned food writer is completely fascinating to me. 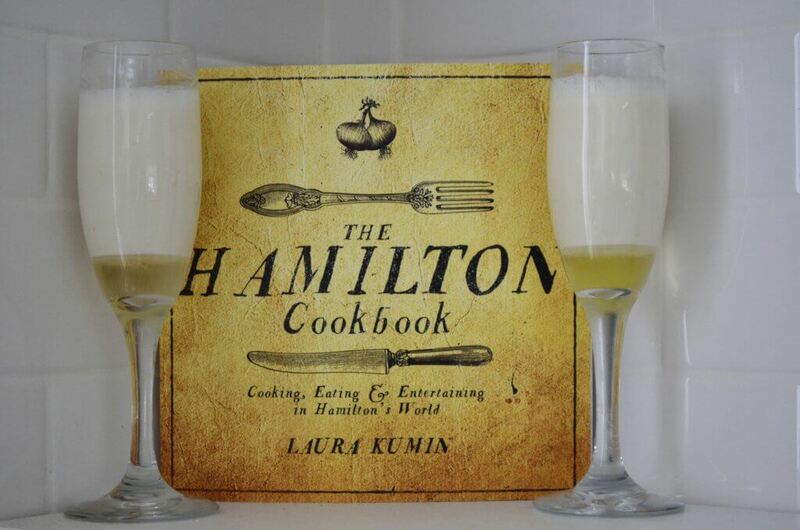 I find Laura to be an exceptional human being and couldn’t be more excited about The Hamilton Cookbook she recently wrote. It’s a really great experience to witness a friend and fellow food blogger publish a cookbook. Sometimes you’re involved in the process and other times not. Regardless, having two cookbooks under my belt, I can certainly appreciate the painstaking process (a.k.a. a labor of love) it is to research, develop and test recipes. Friends and family love the testing phase, but that is a very technical part of every cookbook writer’s life and I knew Laura Kumin would produce a fantastic result. The Hamilton Cookbook (available on Amazon) is a national treasure. At a time when so many of us find it important to preserve our national history but aren’t sure how to exactly do that, Laura has found a way to help create more interest in our Founding Fathers with this book. In it, you will learn what it was like to eat with Alexander Hamilton, what he ate and what his favorite foods were, and how his food was served to him. With this book, you’ll be able to recreate a meal Hamilton might have eaten after a battle or as he composed the famous, Federalist Papers (did you have to read those in school? ), recipes from his humble beginnings in the West Indies to his more posh existence in New York City after the American Revolution. It’s no wonder the Broadway musical Hamilton has been such a hit – the man had a pretty interesting life, and seems as though he was a bigtime foodie, too! There are so many great recipes in this book, but the one I picked to show you was one I thought a halal consumer might just pass by because it calls for white wine it, but that’s an easy fix- see below! This lemony drink is almost like a sherbert-based punch bowl drink served in nice and elegant glasses at a dinner party. I’ve made it so many times since reading The Hamilton Cookbook and my guests have loved it just as much as I do- that’s a good sign! And, it’s SO easy to make- don’t pass up this one! Rub the grated lemon rind into the sugar with your fingers until they are well combined. Mix the rind, sugar, lemon juice, and the white grape juice. Add the cream and whisk the mixture until it froths. Gently pour it into two glasses. Let them stand on a counter for about 2 hours, then refrigerate until serving. As the glasses sit, the froth will rise, leaving the lemony white grape juice on the bottom of the glasses. This entry was posted in alcohol-free, American recipes, Book Reviews, DC, Eat Write Retreat, Founding Fathers, halal drinks, Hamilton, Laura Kumin, Mother Would Know, non-alcoholic drinks, The Hamilton Cookbook. Bookmark the permalink.